A year after its first launch, Saber Interactive went heavy on working on the sequel for its NBA Jam spiritual successor: NBA Playgrounds. Right before its planned launch earlier this year, the game was delayed for no reason, until we discovered that Take-Two picked up the title as its publisher, expanding its NBA 2K franchise to a more arcade-friendly title in its sports catalogue. So is NBA 2K Playgrounds 2 the arcade basketball we need? Like its predecessor, NBA 2K Playgrounds 2 isn’t visually close to 2K Sports’ other basketball game NBA 2K, but it works for its purpose. The artistic direction is mostly fun, banking more on the comic appearances and basketball parodies than going for movie-quality facial animations and sweat drip engines. Plus when you top that with the original soundtrack – even though similar to the original title – the game kind of clicks the arcades tones just right. Like with its graphics, NBA 2K Playgrounds 2 is insanely far from the basketball simulation that is the NBA 2K series. The core of the title is a 2v2 game of basketball, where teams are made from major and iconic players from all NBA teams. This makes the challenge different from NBA Street, and most players need “training” with to be able to level their stats up to its full potential. This means a lot playing, as the level up system can be quite slow, but you can still manage to “control” the skills and shots of your players. While it feels a bit of a compromise from the original game and the simulation-style cousin, all shots and dunks will need you to hit the arrow on a specific part of the on-screen gauge level, which needs to be exact to actual make sure of scoring. On top of that, endurance in the game is also something to pay attention to, as your players cannot indefinitely sprint and try to steal the ball, instead get tired quite easily. This force you to plan better your attack and defence, instead of spamming action buttons. Sadly, this similarity to the original NBA Playgrounds game is also found in its flaws. There’s a constant sense of redundant loop in its gameplay, with no real combo or fluidity that is missed from the days of NBA Jam or even NBA Street. That’s mainly because of one thing: the 2v2 system. While the comparison with NBA Jam is inevitable, it’s when you see the difference between a 2v2 and original 3v3 system that you understand what is missing. Nevertheless, some small boost does alter the game, such as temporary buffs that can be activated after filling a gauge, which gives you the ability to double the score points for example. With this sequel, NBA 2K Playgrounds 2 has also upgraded its offering in terms of game modes. In addition to the customizable friendly matches where you can turn on or off which powers can be obtained, duration of games and more, the game has also a sort of NBA season which will have you play against teams for the global title. Even if it is rather basic in its own way, this mode allows you to unlock an exclusive player from the selected NBA team, and can also be played online. On that front, which was lacking at the launch of the original game on the Nintendo Switch, the Championship mode gives you the chance to compete in 2v2 with 3 other competitors online, as well as a 3-point challenge mini-game. But the main defect of this game is its strange reliance on micro-transactions. While the game is priced at a lower amount than most games launched from big publishers (30$ to be exact), it seems that Saber and 2K have taken inspirations from the free-to-play market to make more cash. Like the first game, NBA 2K Playgrounds 2 has players unlock new athletes as they finish key tasks in the game, via card packs a-la FUT style. But unlike its predecessor, this sequel is based on an aggressive economic model that does everything to encourage the player to tap into their pocket and buy more packs for better players, mainly because the grind behind getting these for free is insane. For example, if you would like a legendary player such as Kareem Abdul-Jabbar or Michael Jordan, we’re talking about spending 25,000 in-game currency or – of course – its equivalent in Golden Bucks which are sold in three different batches and cost either 5, 10 or 20 dollars. Considering the good players are in the more expensive packs, and still rely on luck for you to get when opening, plus there are over 400 players in this roster… It’s a serious problem for gamers that want to unlock everything with their skills instead of excessively grinding the game. 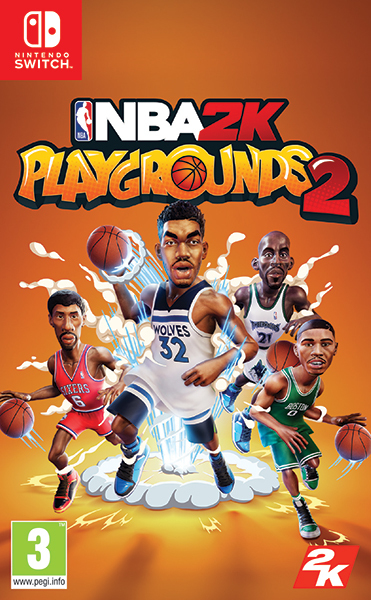 NBA 2K Playgrounds 2 was reviewed using a Nintendo Switch digital code of the game provided by 2K Sports. The game is also available on Xbox One, PlayStation 4 and PC in digital store releases. We don’t discuss review scores with publishers or developers prior to the review being published (click here for more information about our review policy). •	The grind is real!